At 1100 AM AST (1500 UTC), the center of Tropical Depression Nine was located near latitude 14.6 North, longitude 36.0 West. The depression is moving toward the west-northwest near 6 mph (9 km/h). A turn toward the west and an increase in forward speed are expected later today and tonight, with a westward motion continuing into early next week. Maximum sustained winds are near 35 mph (55 km/h) with higher gusts. Gradual strengthening is forecast during the next few days, and the depression is expected to become a tropical storm later today and a hurricane by early next week. The structure of Tropical Depression Nine is improving as the ongoing shear diminishes, with the convection getting closer to the low-level center. However, recent scatterometer data indicates that the system has not yet become a tropical storm, and the initial intensity remains 30 kt. The cyclone is still moving fairly slowly, with the initial motion now 300/5. The subtropical ridge to the north of the cyclone is forecast to steer the system westward with an increasing forward speed for at least the next 2-3 days. After that time, there is some uncertainty in the track forecast due to the formation of a mid- to upper-level trough over the central Atlantic. The Canadian and UKMET models forecast the cyclone to slow down and turn northwestward near the end of the forecast period due to the trough, while the ECMWF and GFS show a continued westward motion. The track forecast follows the ECMWF/GFS scenario and shows a faster westward motion than the previous forecast. The new forecast also lies near the various consensus models. With the shear diminishing, conditions are becoming more favorable for the cyclone to strengthen during the next 72 h. However, there are still concerns about dry air entraining into the system. The new intensity forecast is similar to the previous forecast with the cyclone becoming a tropical storm in about 12 h and a hurricane in about 72 h. After 72 h, the system is expected to encounter another round of shear, which is expected to cause some weakening. Tropical Storm Isaac is the newest member of the Atlantic pack. Christened at 5 pm EDT Saturday with top sustained winds of 40 mph, Isaac was located west of Helene, about 1640 miles east of the Windward Islands, moving west at 7 mph. Isaac will need to traverse the length of the Atlantic tropics before it poses any threat to land. Recurvature is still possible, as indicated consistently by the UKMET and Canadian models, but the bulk of model guidance keeps Isaac heading very steadily westward on a path that would reach the Lesser Antilles around Thursday (as depicted in the NHC forecast). Conditions will favor strengthening over the next several days: wind shear will be low (5 – 10 knots) and SSTs around 27°C (81°F). Later in the week, Isaac will encounter even warmer water (around 28°C) with greater oceanic heat content, but wind shear will also be increasing--perhaps due, in part, to the outflow from Hurricane Florence. The HWRF model, our top performer on intensity in the 2017 season, makes Isaac a solid Category 3 storm by Wednesday: this is considerably above other guidance but is certainly possible. 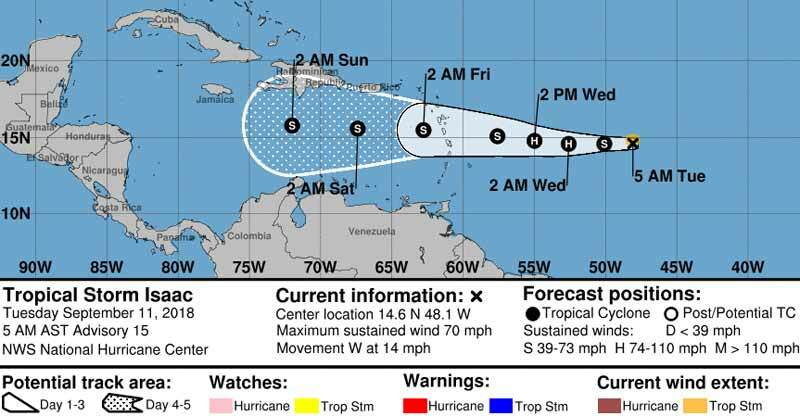 It’s too soon to have a good handle on Isaac’s fate beyond the Lesser Antilles should it get that far. The GFS and European models suggest that steering currents would keep Isaac churning west toward the central Caribbean, with extremely warm water at hand but periods of strong wind shear possible. We may be dealing with Isaac for some time to come. 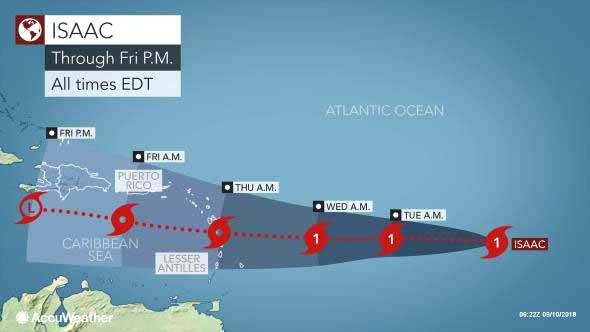 Interests elsewhere across the Caribbean will want to keep close tabs on Isaac's track beyond the Lesser Antilles. Wind shear, or the the change in wind direction and/or speed with altitude, can rip apart small systems such as Isaac. Those of you in Jamaica, the Cayman Islands, Belize and the Yucatan Peninsula might want to keep an eye on Isaac, just in case it starts strengthening again this weekend. The soonest Isaac might start affecting you is around next Monday and next Tuesday. Isaac has not changed much overnight. Satellite images indicate that the strong tropical storm still has a central dense overcast pattern and a limited amount of outer bands. Earlier microwave data indicated that the center was not located in the middle of the convection, however, likely due to some westerly shear. Since the cyclone has changed little during the past several hours, the initial intensity is held at 60 kt, which is an average of the TAFB and SAB Dvorak final T- and CI-numbers. A nearby NOAA buoy shows that the wind field of Isaac is very compact, with tropical-storm- force winds only extending up to 40 n mi from the center. Satellite fixes suggest that Isaac continues to move westward at 13 kt. Although there remains a fair amount of spread in the models, the usually more reliable GFS and ECMWF models continue to show a westward motion during the next several days as the storm moves on the south side of a strengthening mid-level ridge. The NHC track forecast continues to follow that theme, and this forecast lies near a blend of the GFS and ECMWF aids. 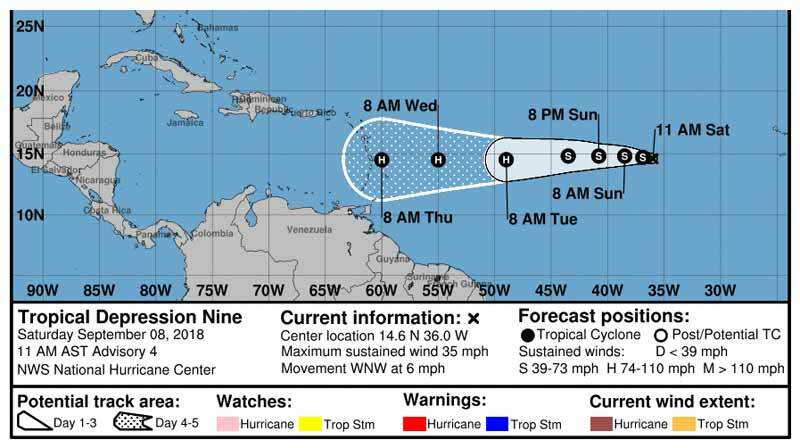 This forecast is a little slower than the previous one, and takes Isaac across the Lesser Antilles and into the eastern Caribbean in 2 to 3 days. Predicting Isaac's intensity has been challenging. Isaac appeared to have been in relatively favorable conditions during the past day or so, but it did not strengthen. The upper-level pattern should remain relatively favorable for another day, so modest strengthening back to a hurricane is possible during that time. Thereafter, however, an increase in shear first from a trough in the central Atlantic and then from the outflow of Florence should cause some weakening when the storm moves into the Caribbean. The models are in a little better agreement this cycle as the HWRF is no longer showing Isaac becoming a major hurricane. The NHC intensity forecast is very similar to the previous one and is fairly close to the consensus aids. Jamaica, the Cayman Islands, Belize and the Yucatan Peninsula might want to keep an eye on Isaac, just in case it starts strengthening again this weekend. The soonest Isaac might start affecting you is around Monday and Tuesday. Finally, we are going to have to watch out for the slight possibility of Isaac being pulled northward into the Gulf of Mexico later next week. This possibility is due to the forecast of Florence hanging around long enough to leave a weakness in the upper level high pressure ridge causing Isaac to possibly turn northward from the western Caribbean into the Gulf of Mexico. At this point, it is a very low possibility, but it is something to keep an eye on. Even though Isaac looks a little more organized today as compared to yesterday, the lower levels of the storm are outrunning the mid and upper levels of the storm. This means that rapid organization and strengthening is unlikely and instead we should either see a steady state storm or one that very slowly strengthens. Isaac is moving nearly due west and this westward course is likely to continue for the next several days as a ridge of high pressure controls its motion. 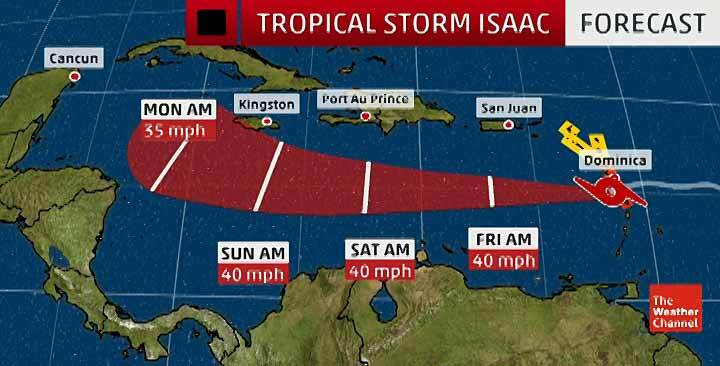 This means that Isaac will likely move right across the central Lesser Antilles on Thursday and then into the eastern and central Caribbean this weekend. The intensity forecast for Isaac continues to be extremely difficult. Even though environmental conditions are favorable for strengthening, Isaac seems to be remaining either at a steady intensity or has weakened a little. With that said, Isaac may still move across the central Antilles as a Category 1 hurricane. By this weekend, the amount of wind shear is expected to increase as Isaac moves westward through the Caribbean leading to the storm weakening. It seems the intensity guidance are in a little better agreement at keeping Isaac within the tropical storm to Category 1 hurricane range. Isaac is a poorly organized tropical storm. 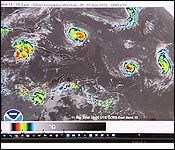 Geostationary satellite and microwave images indicate that the center of the cyclone is located near the western edge of the main area of deep convection. This asymmetric cloud pattern is due to about 20 kt of west-northwesterly shear. The satellite intensity estimates have been decreasing, and an average of the Dvorak CI-numbers supports lowering the initial wind speed slightly to 50 kt. The NOAA Hurricane Hunters are scheduled to investigate Isaac later this morning, and that data should provide a better assessment of the storm's intensity and structure. Isaac continues to move due westward at about 13 kt. The track forecast reasoning remains unchanged. A fairly strong mid-level ridge to the north of Isaac should steer the system westward at about the same forward speed during the next several days. The models are now in fairly good agreement, and the NHC track forecast is just a little north of the previous one to come in line with the latest guidance. Based on this forecast, Isaac is expected to cross portions of the Leeward and Windward Islands in about 36 hours. Isaac is feeling the effects of wind shear, and the global models suggest that the shear will likely remain moderate to strong during the next couple of days. These hostile winds combined with nearby dry air will likely cause Isaac to gradually weaken during the next several days. The intensity models are in fair agreement, and this forecast is close to the model consensus, except a little lower than that aid at 96 hours. The latest runs of the GFS and ECMWF models show Isaac opening up into a trough by day 5, and the NHC forecast follows those models. 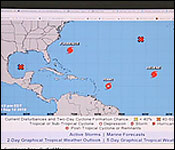 At 500 AM AST (0900 UTC), the center of Tropical Storm Isaac was located near latitude 15.4 North, longitude 59.7 West. Isaac is moving toward the west near 17 mph (28 km/h). This general motion is forecast to continue for the next several days. 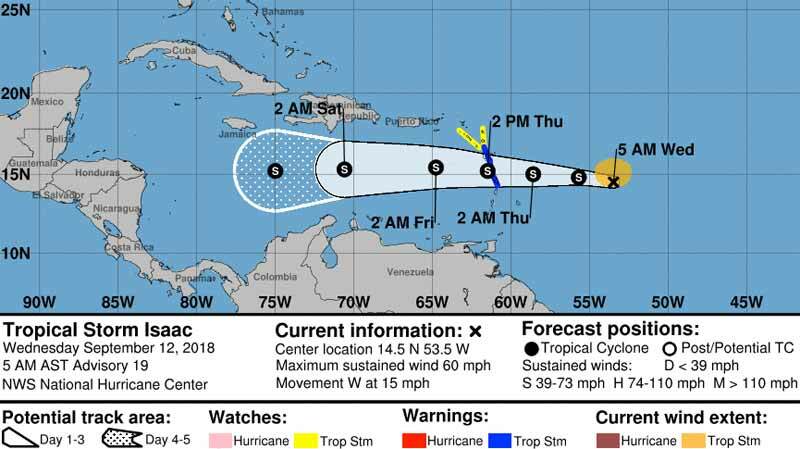 On the forecast track, Isaac is forecast to move across the central Lesser Antilles and into the eastern Caribbean Sea later today, and then move across the eastern and central Caribbean Sea through the weekend. Earlier data from a NOAA Hurricane Hunter aircraft indicate that maximum sustained winds are near 45 mph (75 km/h) with higher gusts. Little change in strength is expected over the next several hours as Isaac moves through the Leeward Islands. Gradual weakening is forecast after that as Isaac moves through the eastern Caribbean. Tropical-storm-force winds extend outward up to 160 miles (260 km) from the center. The estimated minimum central pressure is 1006 mb (29.71 inches). Data from a NOAA P-3 Hurricane Hunter aircraft that departed the storm shortly before 0600 UTC indicated that the tropical storm has weakened a little more. Maximum flight-level winds were around 51 kt, while maximum SFMR winds were only 41 kt. Both of these support an initial intensity of 40 kt. Wind measurements from the plane also suggested that Isaac is close to opening up into a tropical wave and its circulation is likely barely closed at the surface. Another P-3 mission is scheduled for this morning. Isaac is nearly completely devoid of deep convection at the moment, and is not trackable in radar data from Guadeloupe and Martinique. Given the lack of deep convection to sustain the cyclone, continued gradual weakening is expected. However, given the extent of 40 mph winds observed by the NOAA plane, Isaac is still likely to bring gusty conditions to many of the Leeward Islands through this afternoon. The dynamical guidance is now in fairly good agreement on the intensity of Isaac for the next few days, and nearly all of the models depict Isaac opening into a trough between 48 and 96 h. The NHC forecast conservatively maintains Isaac through day 4 in an attempt to maintain some continuity, but it is very possible that Isaac will open into a trough sooner than indicated. Some of the dynamical models suggest that regeneration could occur in the western Caribbean, however the predictability of such an event is too low to explicitly show in the forecast at this point. Isaac is still moving quickly westward, with an initial motion of 275/15 kt. Confidence in the track forecast remains high, and the track guidance is tightly clustered through the forecast period. Very little change was made to the track forecast, which continues to closely follow the HCCA model. As long as Isaac remains a shallow cyclone, it should continue to be steered westward by the low-level tradewind flow, even if, or when, it opens up into a trough. The tropical hurricane zone is hyperactive right now, with four named storms and one developing system out there. But, of greatest concern right now to the Caribbean is Tropical Storm Isaac, which is tonight heading for the lesser Antilles. The storm has been on a westerly track from it became organized into a syStem - and that is expected to continue leading it right to the area between Nicaragua and Belize. But, while that's the bad news, the good news is that the system does not seem to be developing. 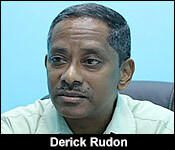 Derrick Rudon at the MET Office told us more:..
"We are at the peak of the season; the peak is in September. So, that is when you see the most storms around and that is exactly the case this year. We should be watching Isaac because forecast brings it into the Caribbean on a straight westward track. The only thing is that the official forecast is for it to dissipate before it reaches the north-west Caribbean." 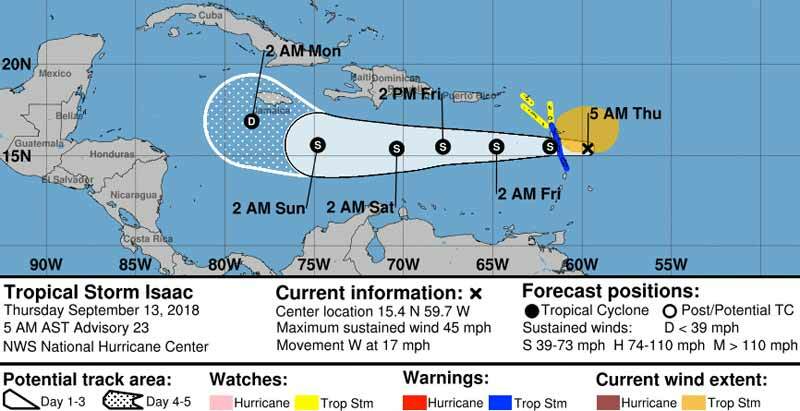 "However, if we watch the four day track, it says that by the time it reaches around Jamaica, south of Jamaica, it will have weakened. How do we interpret that? Usually as storms go along, they gain strength." "Well, sometimes they gain strength, sometimes they weaken. It all depends on the conditions that they are encountering. And this storm is already encountering hostile conditions in the atmosphere." "So, how concerned should average citizens be about it, in terms of making a preparedness plan and also assessing what they will be doing early next week? What movements they will be making if any?" "Well, I think the citizens of Belize should monitor the progress of this storm. If it changes, if the forecast is wrong and it comes towards us then it will be like Monday or Tuesday of next week." "However, the forecast modules are saying that it is not predicted to become a hurricane if and when it makes land fall on the Central American isthmus." "Right, in fact some of the modules dissipated totally before it reaches that area that you are talking about, west of 80 west; so, some of them dissipated totally before it reaches the north-west Caribbean which is west of 80." "Certainly by Sunday we will have an extremely clear picture of what it will or won't do, in terms of the threat assessment?" "By then, if it follows the forecast, it would have dissipated." We will keep monitoring this storm closely. As of 6:00 pm, the maximum winds were still 60 miles per hour. Even though Isaac is a sheared, disorganized tropical storm, it is still producing flareups of shower and thunderstorm activity across the central Lesser Antilles. In addition, Isaac is causing winds of 25-35 mph with higher gusts from Antigua southward to Dominica. So, even though Isaac looks disorganized on satellite imagery, it will still produce tropical storm force winds & heavy showers/thunderstorms across the islands of Antigua, Guadeloupe, Dominica and Martinique today. Weather conditions will gradually improve across the Lesser Antilles on Friday. 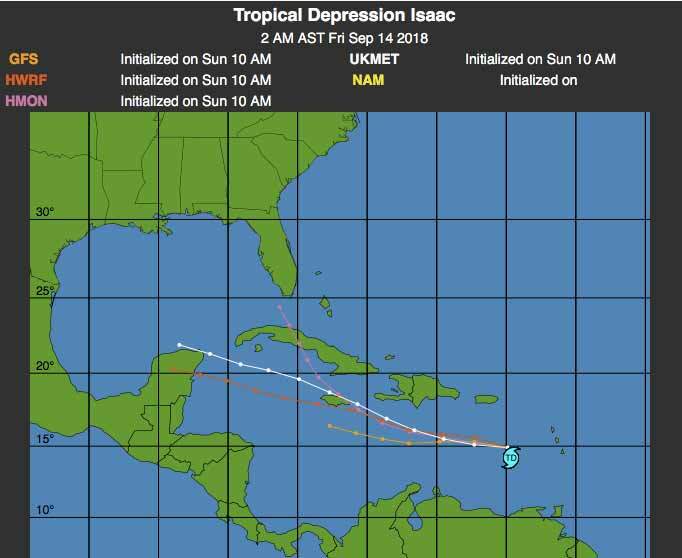 The future of Isaac, when it moves across the Caribbean, is murky at best. The model guidance performance with the forecast intensity of Isaac has been poor so far as they have been flip flopping like crazy between showing Isaac to dissipate in the Caribbean and showing Isaac to strengthen as it moves into the western and northwestern Caribbean early next week. The latest guidance members are no different. The GFS and FV3-GFS model forecasts Isaac to remain very weak in the Caribbean and eventually dissipate. This solution is to be questioned, however, because the GFS model is forecasting a fairly favorable environment for development and intensification once Isaac moves into the western Caribbean. The European operational model, on the other hand, is forecasting Isaac to start ramping up near the Yucatan Channel on Tuesday into Wednesday of next week with the guidance forecasting a track towards the Louisiana coast next weekend. At this point, I think that Isaac is certainly a storm to keep a very close eye on. Even if it opens up into a tropical wave over the next day or two, I think there is a very real potential for it to spin back up into a tropical storm and strengthen as it pushes across the western Caribbean and into the Gulf of Mexico during the early and middle parts of next week. I am monitoring Isaac very closely and will have updates for you in the coming days. At 500 AM AST (0900 UTC), the center of Tropical Depression Isaac was located near latitude 15.0 North, longitude 65.5 West. The depression is moving toward the west near 15 mph (24 km/h), and this general motion with some decrease in forward speed is expected over the next few days. On the forecast track, Isaac will move over the eastern and central Caribbean Sea during the next few days. Maximum sustained winds have decreased to near 35 mph (55 km/h) with higher gusts. Isaac is forecast to gradually weaken over the next few days, and could degenerate into a tropical wave at any time. The estimated minimum central pressure is 1006 mb (29.71 inches). Northwesterly shear continues to take a toll on Isaac. Although the system is still producing areas of deep convection, an ASCAT overpass that arrived shortly after the release of the previous advisory, indicated that the circulation had become even less defined. The ASCAT data also showed that the winds are below tropical storm strength, therefore the initial intensity has been reduced to 30 kt. Moderate to strong northwesterly shear and dry mid-level air are likely to cause additional weakening, and Isaac is forecast to degenerate into an open wave within the next several days, but this could occur much sooner if the current trends continue. When the system reaches the western Caribbean Sea the shear may relax somewhat and moisture levels are expected to be higher. These conditions could allow for regeneration of the system, but the ECMWF and GFS both show Issac weakening and moving over the western Caribbean as an open wave, and the NHC forecast follows this scenario. A low- to mid-level ridge over the southwestern Atlantic continues to steer Isaac westward, and this general motion should continue until dissipation occur. The new track forecast is once again essentially an update of the previous advisory. 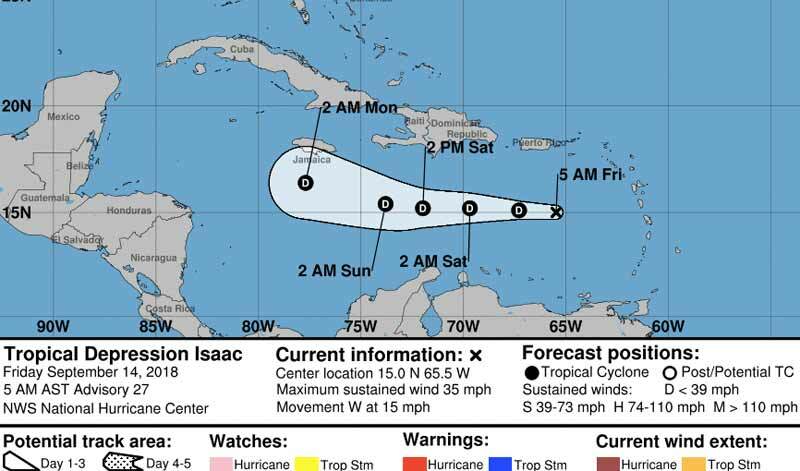 There are a few named storms in the Atlantic and the one that has the attention of the weather forecasters in Belize is Isaac. Deputy Chief Met. 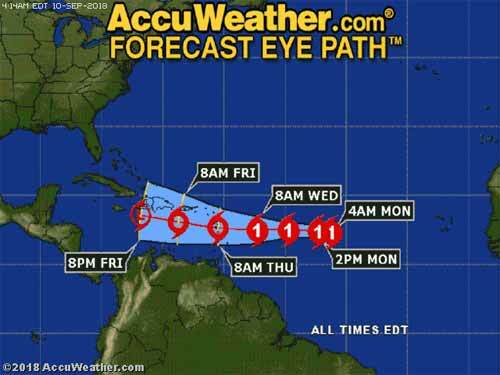 Officer, Derrick Rudon says Hurricane Isaac has entered the Caribbean and is heading west. Derrick Rudon Deputy Chief Met. Officer: “Okay Isaac has entered the Caribbean this morning and the projection is for it to continue straight West. The good news is that the official forecast is for Isaac to desipate by the time it reaches the Western Caribbean Sea which will be just in front of us so that is the good news but the track has been consistently for a straight westward movement. Right so it has followed that so far, the track but it has weakened since yesterday and the forecast is for it to continue to weaken. In fact they don’t even know if it will even make as far as towards the Western or the North Western Caribbean. While the season was expected to be above average, Rudon says activity is now projected to be a slightly below average for the hurricane season. Isaac continues to be a system that is very difficult to forecast in terms of intensity. Even though northwesterly wind shear is still impacting Isaac, it is producing areas of deep convection across the eastern Caribbean. In addition, water vapor imagery indicates that quite a bit of dry air is positioned to the north and west of Isaac and as long as this dry air impacts the system, it wont be able to organize. The big question with Isaac is how much will be left of the system by the time it reaches the western Caribbean early next week where the wind shear is expected to become favorable for intensification. The European model has backed off on strengthening Isaac in the western Caribbean and the GFS model shows this system as a open tropical wave by the time it reaches the western Caribbean. In addition, there are a lot less members of the European ensemble guidance that show strengthening in the northwestern Caribbean and Gulf of Mexico next week (only 2 members out of 51 show intensification now). The track intensity guidance are split with some of the guidance forecasting Isaac to remain a tropical depression while the other half forecasts intensification all the way to hurricane strength during the first half of next week. It should be noted that the HWRF model, which tends to overstrengthen systems, forecasts no regeneration of Isaac. At this point, I think that the environmental conditions may be too unfavorable over the next 2 to 3 days and we should probably see Isaac degenerate into a tropical wave this weekend. As we get into early next week, I still think that we will need to keep an eye on whatever is left of Isaac in the western and northwestern Caribbean. Even though the model guidance do not forecast development or intensification, there is expected to be an atmospheric upward motion pulse called a Kelvin Wave moving across the Caribbean this weekend. It is possible that this could help Isaac to strengthen early next week and it is something to keep an eye on. Either way, I am monitoring Isaac closely and will have additional updates for you in the coming days. Last edited by Marty; 09/14/18 07:55 AM.